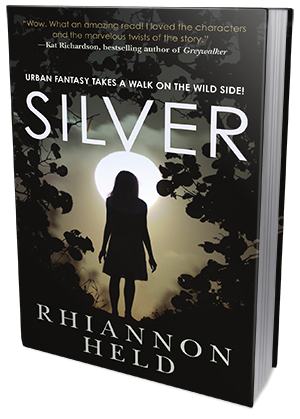 Urban fantasy takes a walk on the wild side with Rhiannon Held's remarkable debut. Andrew Dare is a werewolf. He’s the enforcer for the Roanoke pack, and responsible for capturing or killing any Were intruders in Roanoke’s territory. But the lone Were he’s tracking doesn’t smell or act like anyone he’s ever encountered. And when he catches her, it doesn’t get any better. She’s beautiful, she’s crazy, and someone has tortured her by injecting silver into her veins. She says her name is Silver, and that she’s lost her wild self and can’t shift any more. The packs in North America have a live-and-let-live attitude and try not to overlap with each other. But Silver represents a terrible threat to every Were on the continent. Andrew and Silver will join forces to track down this menace while discovering their own power…and passion for each other. At night sometimes Silver would invite Death to sit with her. He hulked there opposite her, smug and black. He was blacker than night or a raven's wing or anything Silver could remember when words and memories wiggled and twisted from her grasp. But then, he was Death. That was description enough. The man was some kind of warrior, Silver decided. He was the first she'd seen since she started walking in the Lady's realm who seemed quite real, besides Death and the monster. He didn't shine with Her light from within like one of Her champions, but Silver didn't mind. Now that she wasn't half hidden by the doorjamb, the towel was awfully short, part of Andrew's brain informed him. It revealed a lot of leg. Silver was engaging read that I was pulled into from the start. Rhiannon Held wastes no time in making the story intriguing, and securing my attention from the start. This book was an outstanding debut and I was excited that it was just about what I expected and hoped for. Urban Fantasy is not a genre that I often pick up, or not that I am aware of. Not that I have anything against it, but more that I just tend not to be pulled toward it as often as I am other genres. There was however, something about Silver that called to me from the start. Silver was such a wonderfully paced and intriguing story that I easily found myself stuck in the book. There was a simplicity in the world that was easy to follow and yet it was still gritty an something of its own. You get an idea of how this worlds hierarchy works, and how everyone exists within it. Despite that this may sound like a lot, it was easy to take in and remember. This is probably due to the fact that Held did a great job pacing the story, creating a book that kept you turning the pages and never getting that lost feeling. Silver was a unique character. She comes off nuts, speaking to Death and claiming the Lady has left her, but there is much truth in the things that she says. To say when you meet this girl she is at a weak point in her life would be an understatement, yet somehow her strength does show. There are many things that set Silver apart from other characters that I have read and only reading her can do her justice. She is strong in her weakness and has so much t lose and yet so little left to give. My heart went out to her by the end for everything that she has lost and the things it seems she may never get back. Silver may just be one of my favorite female Werewolves now. Andrew is far from innocent. With a past that now makes the others cautious of him or dislike him, Andrew is an enforcer but belongs to no pack in particular. So, he is a solitary without being a rogue and is charged with keeping things in order. His feelings for Silver are not romantic at all to start, she is simply another problem to be solved, that ends up being more of a problem than expected. However, when you are used to being on your own and suddenly you are not things change easily. I will not say that the romance in this read is more overpowering than the plot or the developments because it is not but it is there teasing me into hoping that something more becomes of it all. Silver was a great start to this series and I look forward to reading the rest. Rhiannon Held has created a gritty and well crafted Were system and world, that lives among us. The writing was absolutely spectacular and looking back I can't even recall something that really bothered me. This was not like the other Urban Fantasies that I have read but I am okay with that because it was amazing in its own way! I would recommend you pick this up if you are looking for a good Were read, and something that is easy to get into.